Do not always decorate mean having a big budget but knowing certain bases to exploit your environments to the fullest. Add ideas! 1) In small spaces, use light colors and pastels on the walls; place mirrors to multiple natural lights and low-rise furniture. 2) Add a focal point to your decorations. This is, an element that contrasts with the rest and that forces your guests to look at it. 3) If you add pictures to your decorations, do not put them too high. The correct height must respect the range of vision of the people: between 1.50m and 1.72m. 4) It is said that a good combination does not exceed 3 colors. 5) Identify the color of an element that you want to highlight and duplicate it in the environment. Make that color occupy maximum 20% of the environment to create a harmonic contrast. 6) Put a picture in the living room or in the dining room. It will give prominence and a different style to that space. Use colors that make contrasts. 7) Organize your books with style: combine coatings and accessories that match the furniture around the library. 8) Use furniture that makes a contrast in your spaces, that way it will not look monotonous. 9) In modern bathrooms the medicine cabinet is stored in other parts, leaving the mirror a decorative accessory. Try different shapes and sizes: round, oval, square; with a wooden frame, metal or without a frame. 10) Use boxes inside your furniture, that way you can store more objects and your space will be clean. 11) The trick to decorating a corridor is not to hinder the transit of people. You can use thin and tall furniture. 12) If you decorate a bathroom, consider that the furniture not only have to look good, but they have to be practical. In this space, the beautiful is the user. 13) A floor in a clear tone will help you dramatically improve the lighting of a space with little light. 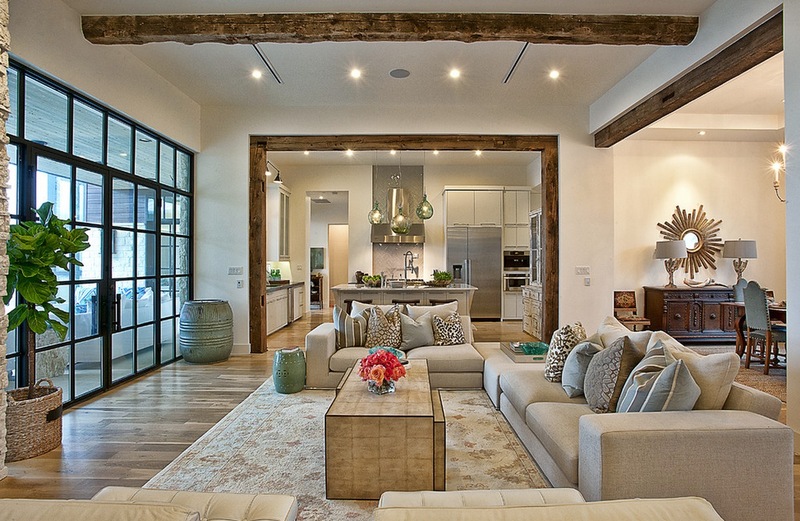 14) Create contrasts between your furniture and floors. 15) Add plants to your spaces. 16) The wicker baskets are excellent for decorating and at the same time organizing the spaces. Use them! 17) Use flowers in your bathroom, they will look amazing. 18) When you design the kitchen, the color you select for the walls will play an important role since it will impose the tone of the rest of the space. 19) Use small furniture and different color to your walls, that way they will stand out more. 20) If your dining room is small I recommend a roundtable with thin chairs, thin lines, and no arms.